To understand German thinking of this period one must first understand that they looked back to the Frankish King, Karl the Great (Charlemagne), and his "Holy Roman Empire," which lasted from 800 to 925, as the first great Deutsches Reich (German Empire). In 962, Karl's grandson, Otto I of Germany was re-crowned "Emperor of the Romans" by Pope John XII, thus giving the German kings once again claim to the title "Holy Roman Emperor." From this time forward, the German kings would continually claim the right to rule this central European empire. The empire's territory was centered on the Kingdoms of Germany, and included some neighboring territories, which at its peak included the Kingdom of Italy and the Kingdom of Burgundy. The Flag of the Holy Roman Empire was not a national flag, but rather an imperial banner used by the Holy Roman Emperor. Usually a black eagle was placed on either a golden or white background. One source claimed the gold field was for the Emperor's flag, and the white field for the Empire's flag. In 1401, a double-headed eagle replaced the single-headed eagle on the Imperial Banner of the Holy Roman Emperor. Described as: "Double-headed imperial eagle displayed with a halo sable armed and langued gules." There were two versions, one with haloes and one without. In 1804, the Holy Roman Emperor Francis II of the Habsburg Dynasty declared his domain to be the Austrian Empire and became Francis I of Austria. The first flag of the Austrian Empire was black and gold using the colors from the banner of the Holy Roman Emperor. Francis II became the last Holy Roman Emperor after Napoleon I of France defeated Austria in 1806. The traditional colors black, yellow/gold, red, and white (plus green after Austria united with Hungary) were often used in the national and military flags of the Austro-Hungarian Empire until 1918. Voltaire once commented that the Holy Roman Empire wasn't really "Holy," wasn't really "Roman," and wasn't really an "Empire." Similarly, the flag of the Holy Roman Empire was not an actual national flag, but rather an Imperial banner used by the Holy Roman Emperor. The Holy Roman Empire (Heiliges R�misches Reich) was a strange political unity that existed between 962�1806 in Central Europe. It was first ruled by a strong Holy Roman Emperor, but as time passed its actual structure changed as the power of the Holy Roman Emperor was gradually weakened in the Enlightenment by the increasing power of the German princes and it became more of a weak union or confederation of territories in the end. On the Imperial banner a black eagle was usually placed on either a golden or white background. One source claimed the gold field was for the Emperor's flag, and the white field for the Empire's flag. At the beginning of the 15th century, the Holy Roman Empire consisted of hundreds of smaller sub-units, principalities, duchies, counties, Free Imperial Cities and other domains. The actual "power" of the Empire was depended on the personality of the respective Emperor. Even worse, local dukes often started feuds against each other that escalated into local wars. The whole medieval idea of unifying all Christendom into a single political entity, of which the Church and the Empire were the leading institutions, had become a pipe dream. 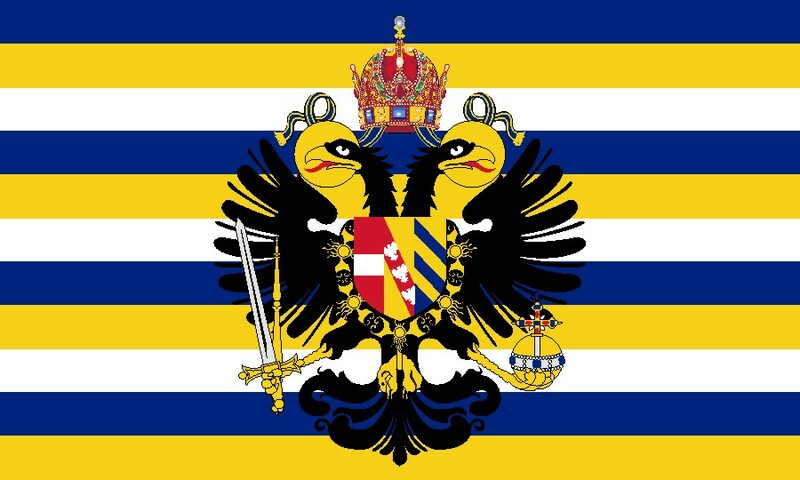 Imperial Banner von Friedrich III. Frederick of Habsburg had three different names, because he inherited three different titles. He was Frederick V, the Duke of Austria, from 1424. He was Frederick IV, the successor of Albert II, as German King from 1440, and he was Frederick III, the Holy Roman Emperor from 1452. During his time as the Holy Roman Emperor, Frederick had the Imperial banner charged with the arms of Austria as an escutcheon in 1437. In 1438, Imperial banners, minus the escutcheon or haloes, but with a sword, sceptre and imperial crown added, were reported. These variant Imperial banners reportedly sometimes also had a red border. Imperial Banner Maximilians I. und Karl V.
Maximilian I, the son of Frederick III, was King of the Germans from 1486 and Holy Roman Emperor from 1493 until his death. He had ruled jointly with his father for the last ten years of his father's reign (1483-1493), and when he became sole ruler, although he expanded the influence of the House of Habsburg through war and marriage, but he also lost the Austrian territories of his father in Switzerland to the Swiss Confederacy. In 1493, the escutcheon with the coat-of-arms of Maximilian I (1495-1519) was added to the Imperial Banner, and later used by Charles V (1500-1558) until 1519. Imperial Banner von Kaiser Karl V.
By marrying his son Philip the Handsome to the future Queen Joanna of Castile in 1498, Maximilian I established the Habsburg dynasty in Spain and allowed his grandson Charles to become the King of Spain and later as Charles V he became the Holy Roman Emperor in 1519, thus he ruled both the Holy Roman Empire and the Spanish Empire at the same time. In 1519, the escutcheon with the coat-of-arms of Maximilian I was replaced with that of Charles V on the Imperial Banner. The very size of the territory controlled by the Holy Roman Emperor was huge, and many of his forces came from a variety of vassal states. This led to a whole range of different military standards being used by his military forces, a few of which will be shown here. According to some sources, the Blutfahne (blood banner or flag), was the battle flag originally used by the Holy Roman Emperor. Later, when a German vassal was given a fief in the 13th Century by the Emperor, with the "jurisdiction of the blood," (the power to take life), the blood banner was used as a sign of that power and sometimes the red flag was used by the vassal as his battle banner. Some landsknechts in the late Middle Ages also used the Blutfahne as the battle flag. The Blutfahne, as described, was a square, red flag, as most banners of the time were, and were sometimes carried into battle by Holy Roman troops. Later the white cross was added. The colours red and white were very significant in the Holy Roman Empire. When the Holy Roman Empire took part in the Crusades, a red and white war flag was flown alongside the black-gold Imperial banner. This flag had a white cross on a red background: the reverse of the St. George's Cross used as the flag of England. An additional military flag associated with the Empire worth mentioning is the Sankt Georg Fahne - a white St. George's cross on a red field, frequently with a schwenkel, or red tail. It basically was the Military Flag of the Holy Roman Empire (above), square instead of retangle shaped, with the tail added. Like the Imperial Banner, the War flag, also known as the Reichsturmfahne, or Imperial Assault Banner, had a black (one-headed) eagle on a gold field, with a red schwenkel (tail) attached. During the Holy Roman Empire, counties (Graftschaft) were ruled by Counts. F�rstenberg was one such county in Swabia, present-day southern Baden-W�rttemberg, Germany. It was originally called the county of Freiburg, but Count Henry I, the Count of F�rstenberg (1250�1284), renamed it after his residence at F�rstenberg Castle at the beginning of his reign. Over the centuries, the various counts and Princes expanded their territories, and in 1667, F�rstenberg, now called F�rstenberg-Heiligenberg, was raised to a principality and received a vote at the Reichstag. In 1744, the various F�rstenberg territories were united to the Principality of F�rstenberg-F�rstenberg, as all the F�rstentum ruling lines except one had become extinct. Finally, the Rheinbundakte of 1806 completely dissolved F�rstentum F�rstenberg. Most of its territory was given to Baden; smaller parts were given to W�rttemberg, Hohenzollern-Sigmaringen, and Bavaria. Today, F�rstenberg is a municipality in the district of Holzminden, in Lower Saxony, Germany and lies on the River Weser in the Weser Uplands near H�xter and Holzminden. The F�rstenberg China Factory, founded in 1747, is the second-oldest porcelain manufacturer in Germany. Accroding to source this regiment was divided into at least 10 companies. The image of the 6th company is given, the flags of the companies 7, 8, 9 and 10 are described. [neu39a] mentions, that this type is very seldom. The companies of this regiment all have the same pattern, but the colours are varied. So having the same pattern, the flags can be reconstructed. All companies of this regiment had a flag with ratio est. 4:5 and had been divided per bend. The flags of companies 1 to 5 are not described. Probably the basic colour of 1st company was white (colonel), but there is no proof. Flags used at the Battle of Moncontour 1569 during the Third Huguenot War (1568-1570) were quite distingue. The war fought between the Catholics and the Protestants (Huguenots) broke out half a year after the end of the 2nd Huguenot war. The Protestants were defeated in March of 1569 at Jarmac and their leader Louis I of Bourbon-Cond� was captured and executed, Admiral Coligny, the new leader of the Protestants, was defeated at Moncontour in October of 1569. The winner was the future King of France, Henry III. The German Duke Wolfgang of Palatinate-Zweibr�cken had decided to help his French brothers in France. He died during the campaign and the colours of his regiments got lost in the Battle of Moncontour. The troops on foot of that era used rectangular flags, sometimes with embowed ends and fixed at a short flagpole, while the cavalry used triangular standards. This is what his Ducal Regiment Flag looked like. This is an example of a Ducal cavalry flag used at the Battle of Moncontour in October of 1569 during the Third Huguenot War in France. It is a triangular pennant, mainly white but with blue, black and yellow pieces of cloth. The white cross of the alliance of Huguenots is placed into the upper blue piece of cloth. The Regiment Hohengeroldseck was lead by Count Quirin Gangolf of Hohengeroldseck, which was a small territory in the Black Forrest. The Count was colonel of 15 companies and in service of Wolfgang of Palatinate-Zweibr�cken. The flags of all companies were red and yellow with the white cross. The patterns of the companies were different. The hoist was yellow, flamed five times horizontally red. The fly was red with the white cross of the Alliance of Huguenots atn its center. The Regiment Granweiler was another German regiment at the Battle of Moncontour in October of 1569 during the Third Huguenot War in France. This regimental flag had a 7-stripes, divided horizontally. 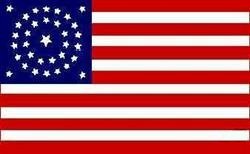 The central stripe was red with the white cross of the Alliance of Huguenots in its center. The others stripes were from top to bottom: red-yellow-mixed colors-mixed colors-blue-white. The mixed color stripes were divided horizontally twice into blue-red-yellow-white(upper) and white-yellow-red-blue(lower). Again the very size of the territory controlled by the Holy Roman Emperor, divided into what were called "Imperial Circles," consisting of hundreds of smaller sub-units, principalities, duchies, counties, Free Imperial Cities and other domains, that it was mind boggling. The Empires lands were so huge and varied that this led to a whole range of different territorial standards, banners and flags being used by the Empire at different times, only a few of which will be shown here. His Imperial holdings included the territories in the Austrian Circle, the territories in the Bavarian Circle, the territories in the Electoral Rhenish Circle, the territories in the Electoral Rhenish Circle, the territories in the Lower Rhenish-Westphalian Circle, the territories in the Lower Rhenish-Westphalian Circle, and the territories in the Upper Rhenish Circle, to name a few. They included at one time the modern countries of Germany (except Southern Schleswig), Austria (except Burgenland), the Czech Republic, Switzerland and Liechtenstein, the Netherlands, Belgium, Luxembourg and Slovenia (except Prekmurje), and significant parts of eastern France (mainly Artois, Alsace, Franche-Comt�, Savoy and Lorraine), northern Italy (mainly Lombardy, Piedmont, Emilia-Romagna, Tuscany, Trentino and South Tyrol), and western Poland (mainly Silesia, Pomerania and Neumark). Shown here are examples of the flags used by the Imperial cities of the Holy Roman Empire. Imperial Cities were ruled by secular princes. As vassals of the Emperor, they paid taxes to the Emperor and had to supply troops for his military campaigns. Imperial Cities had representation in the Reichstag of the Holy Roman Empire. Nuremberg is located today in the German State of Bavaria. it is located about 105 miles north of Munich. Nuremberg was often referred to as the "unofficial capital" of the Holy Roman Empire, because the Reichstage (Imperial Diets) and courts met at Nuremberg Castle. In 1219, Frederick II granted a "Great Letter of Freedom" (Gro�en Freiheitsbrief), to Nuremberg which gave the town rights to mint their own coins and collect their own customs fees. Nuremberg soon became, with Augsburg, one of the two great trade centers on the route from Italy to Northern Europe. Memmingen is a town in the Bavarian region of Swabia in Germany. It was the central economic, educational and administrative center in the Danube-Iller region during the Holy Roman Empire. The Union of Saxony, Poland and Lithuania (Sachsen-Polen-Litauen), also called the Polish-Lithuanian Commonwealth (1569�1795), was the largest and one of the most populous countries of 16th and 17th Century Europe. At this time, Poland and Lithuania were ruled by a common monarch, but they were not considered a single country, but two separate countries who happened to be ruled by the same king. This is the Royal banner (not a flag - the notion of a national flag did not exist at the time) of the Polish-Lithuanian Commonwealth during the rule of the House of Vasa (1587-1668). The banner has a field of three horizontal stripes of red, white and red, and is charged with a double coat-of-arms: the large one features a Polish eagle in the first and forth quarters, and a Lithuanian knight in the second and third quarter covered by a royal crown. This smaller arms defacing the larger, has the Swedish three-crowns in quarters 1 and 4, and the Swedish lion in quarters 2 and 3. The whole thing is surrounded by the Order of the Golden fleece. The House of Wettin was a German dynasty that once ruled the German State of Saxony and Thuringia for more than 800 years. This powerful family inter-married with other Royal families of Europe and ascended the thrones of Belgium, Bulgaria, Poland, Portugal, and Great Britain as counts, dukes, prince-electors and kings. The royal families of the United Kingdom and Belgian are descendants of the Wettin royal line today. Bavaria is one of the oldest states of Europe dating back to Roman times. In the Middle Ages it was established as a duchy, and eventually the Duke of Bavaria became a Prince-elector of the Holy Roman Empire. The Kingdom of Bavaria existed from 1806 to 1918, and after that Bavaria became a free state (republic), formally the Free State of Bavaria, located in the southeast of Germany. The Flag of Bavaria consists of an array of blue and white lozenges (diamond-shaped objects (charges) that are placed on the field of the shield or flag. The lozenges are usually somewhat narrower than they are tall. The Electorate of Cologne (Kurfürstentum Köln) was a principality of the Holy Roman Empire ruled by the Archbishop of the City of Cologne. Between the 10th and the early 19th century, it mirrored the Roman Catholic Archdiocese of Cologne (Erzbistum Köln). The flag of the Archbishopric-Electorate of Cologne was very reminiscent of the flag of the Knight's Templar with its black St George's Cross on a white field. The German Catholic League (Katholische Liga) was a confederation of Roman Catholic German states formed in 1609 after the founding of the Protestant Union a year earlier. The competition of the Protestant Union, as an instrument of the Protestant reformers, and the German Catholic League, an instrument of the supporters of the Catholic Church, foreshadowed the episodes of civil disobedience, repression, and retaliations that would eventually ignite the Thirty Years' War. Holstein-Gottorp is the historical name for the parts of the Duchies of Schleswig and Holstein that were ruled by the Dukes of Schleswig-Holstein-Gottorp. The territories of Gottorp are located in present-day Denmark and Germany. The Dukes ruled from Gottorf Castle in the city of Schleswig in the Duchy of Schleswig. This red swallow-tailed Merchant Ensign was used by the commercial ships of the Duchy of Holstein-Gottorp. Centered on its red background is the golden shield of Schleswig featuring two blue lions, placed over the white nettle leaf of Holstein. Kur-Brandenburg, also known as the Margraviate of Brandenburg (Markgrafschaft Brandenburg), was a major principality of the Holy Roman Empire from 1157 to 1806. Also called the March of Brandenburg (Mark Brandenburg), or the Electorate of Brandenburg (Kurf�rstentum Brandenburg), its rulers became some of the prince-electors who voted for the Holy Roman Emperor. In 1815, the Margraviate of Brandenburg was replaced with the Prussian Province of Brandenburg. The term "Mark Brandenburg" is still used sometimes today to refer to the Federal State of Brandenburg in the Federal Republic of Germany.